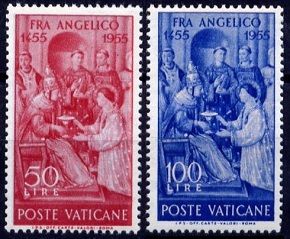 The commemorative and definitive Vatican stamps issued between 1954 and 1955 celebrate important people and events in Church and World history, including popes, saints, and an early Renaissance painter. The two pictorial commemorative Vatican stamps shown above (Sc. #174-175) were issued on February 12, 1954 to celebrate the 25th Anniversary of the Signing of the Lateran Pacts, the treaty that made Vatican City an independent city-state. The common design features Pope Pius XI and a view of Vatican City. 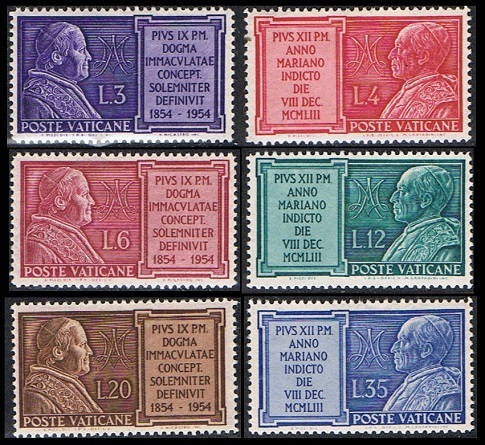 The six pictorial commemorative Vatican stamps shown above (Sc. #176-181) were issued on May 26, 1954 to celebrate Marian Year (1954) and the 100th Anniversary of the Dogma of the Immaculate Conception (1854). The two common designs feature Pope Pius IX and a Pope Pius XII. The three pictorial commemorative Vatican stamps shown above (Sc. #182-184) were issued on May 29, 1954 to celebrate the Canonization of Saint Pius X on May 20, 1954. The common design features the likeness of Pope Pius X with a Halo. Scarce varieties of these stamps exist imperforate. The two pictorial commemorative Vatican stamps shown above (Sc. #185-186) were issued on October 1, 1954 to celebrate the 200th Anniversary of the Consecration of the Basilica of St. Francis of Assisi. The two pictorial commemorative Vatican stamps shown above (Sc. #187-188) were issued on November 13, 1954 to celebrate the 1,600th Anniversary of the Birth of St. Augustine. Aurelius Augustinus or Augustine of Hippo (354-430) was an early Christian theologian and philosopher from Hippo Regis (modern day: Annaba, Algeria). Augustine was also the Bishop of Hippo Regis from 395 to 430. His writings had a tremendous influence on the development of Western Christianity and Western philosophy, and he is viewed as one of the Church fathers in Western Christianity. Two of his most important books are "The City of God" and "Confessions". Augustine was canonized, following popular acclaim, by Pope Boniface VIII in 1298. He is the patron saint of printers and theologians. The three pictorial commemorative Vatican stamps shown above (Sc. #189-191) were issued on December 7, 1954 to celebrate the End of the Marian Year. The common design features "Our Lady of the Gate of Dawn" in Vilnius, Lithuania. The "Our Lady of the Gate of Dawn" icon is in the chapel of the "Gate of Dawn", the last remaining city gate of the medieval city of Vilnius, Lithuania. The city gate was built in the 16th Century, and the religious icons within it were intended to guard the city from attacks and to bless travelers. Today, the Gate of Dawn is one of the most important religious, historical, and cultural monuments of Lithuania. The three pictorial stamps shown above (Sc. #192-194) were issued on April 28, 1955 to commemorate the 1,200th Anniversary of the Martyrdom of St. Boniface. The common design features St. Boniface and Fulda Cathedral. St. Boniface (675-754) was born in Anglo-Saxon England, and he was a leading figure in spreading Christianity throughout the Germanic areas of the Frankish Empire during the 8th Century. He helped shape Western Christianity, and many of the dioceses he founded still exist. He was the first Archbishop of Mainz, and he is the patron saint of Germany. During a mission to Frisia in 754, he and his traveling companions were attacked and killed by Frisian bandits. His remains were buried in the Fulda Cathedral. The two pictorial stamps shown above (Sc. #195-196) were issued on June 27, 1955 to commemorate the 500th Anniversary of the Death of Fra Angelico. The common design features Pope Sixtus II and St. Lawrence, from a fresco by Fra Angelico. Guido di Petro (1395-1455), also called Fra Giovanni da Fiesole, Fra Giovanni Angelico, or Fra Angelico by his contemporaries, was a Dominican Friar from Tuscany and one of the great painters of the Early Renaissance. After his move to Florence in 1436, Fra Angelico's painting attracted the attention of Cosimo de Medici (1389-1464) who quickly became one of his major patrons. Between 1445 and 1455, he was commissioned by Pope Eugene IV (1383-1447) and by Pope Nicholas V (1397-1455) to paint frescoes in St. Peter's Basilica and in the Niccoline Chapel. Fra Angelico was beatified in 1982 by Pope John Paul II. 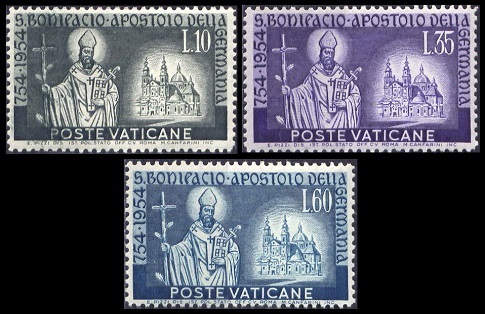 The three pictorial Vatican stamps shown above (Sc. #197-199) were issued on November 28, 1955 to commemorate the 500th Anniversary of the Death of Pope Nicholas V.
The common design features a portrait of Pope Nicholas V.
Pope Nicholas V (Lived: 1397-1455, Pope: 1447-1455), born Tomasso Parentucelli, was a key figure of the Roman Renaissance. He strengthened fortifications, restored aqueducts, and rebuilt many churches. The glories of the Leonine City, Vatican City, and St. Peter's Basilica are also partly attributable to him. 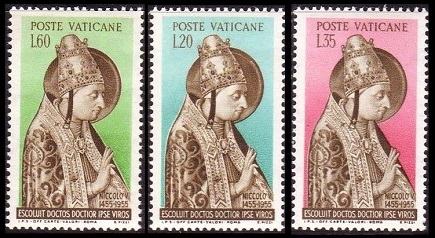 The three pictorial Vatican stamps shown above (Sc. #200-202) were issued on December 29, 1955 to commemorate the 900th Anniversary of the Death of St. Bartholomew, the Second Abbot of Grottaferrata. The common design features St. Bartholomew and the Basilian Abbey of Santa Maria in Grottaferrata near Rome. Bartholomew of Grottaferrata (c. 970-1055) was one of the two founders of the Basilian Abby of Santa Maria in 1004. He was the second Abbot of Grottaferrata, and he supervised the completion of the abbey in 1024. Under his leadership, the abbey became a center for education and manuscript copying.